NOSH 1.7 Released (more features AND it went on a diet)! Version 1.7.0 is now out! There are some big changes in this release include the ability to install the SNOMED CT databases (as long as you have a license…if you’re a practitioner in the US, you can get it and then incorporate with NOSH with the following instructions). With this version, you can incorporate Vivacare patient education materials (see instructions below). The other BIG announcement is the NOSH’s ability to export HL7 Consolidated Clinical Document Architecture (C-CDA) documents as outlined in Blue Button Plus. There are some significant user interface improvements and the ability for the practitioners to configure their orders templates from the main screen. One sneak peak in the future of NOSH is the ability for users to generate their own templates for the history of present illness, review of systems, and physical examination sections. It’s not fully functional yet, but the foundations are starting to be built. My hope is that with the completion achievement of my Indiegogo goal, the template functionality will be complete. Yeah! Here’s the complete list of the changes/fixes/updates in 1.7.0. * New Feature – Schedule views and date last viewed saved automatically. * New Feature – Lot number field in supplements inventory. * New Feature – Patient instructions from Vivacare (register for free). * New Feature – Ability for provider to select time increments in schedule in dashboard (default 20). * New Feature – SNOMED CT database integration. 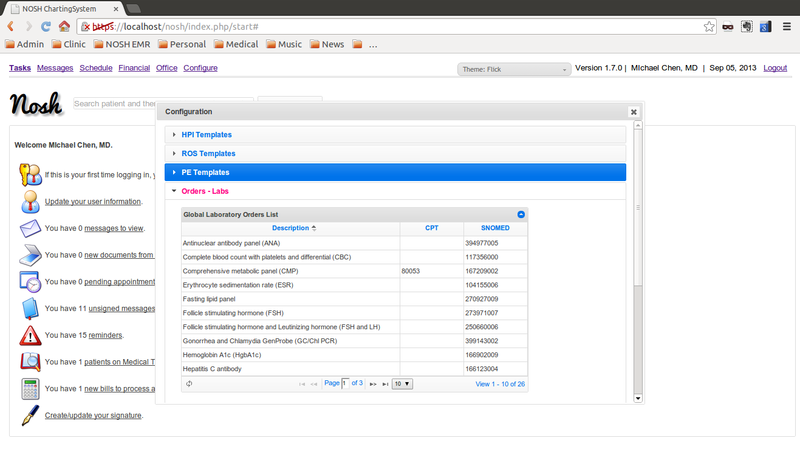 * New Feature – Configuration of templates and CPT codes for provider and assistant users. * New Feature – Ability to customize Box 31 and 32 of HCFA-1500 printout based on insurance provider. * New Feature – Export C-CDA files from encounters. * Update – Scheduled appointments are in the time zone of the server (not client browser). * Update – Minimum number of characters before autocomplete for patient is reduced to 1. * Update – UI for Admin setup views improved. * Update – rCopia sync is now coded in NOSH instead of Mirth to reduce connection errors. * Update – Changed CAPTCHA method for registration so that it is more compatible to touchscreen devices. * Update – Updated NOSH capture of incoming faxes from RingCentral and MetroFax. * Update – Ability for provider and assistant user to configure CPT and orders templates from encounter and chart. * Update – Ability to select for Group Health Plan, FECA, and ChampVA as insurance types. * Update – UI improvements in theme changer and referrals dialog. * Fixed – Removed purchased supplements from HCFA-1500 claims. * Fixed – Counting for Referrals incorrect in Documents dialog. * Fixed – Inability to enter payments for encounters under Encounters Submitted grid in Financials. * Fixed – Autocomplete not showing correctly under MTM dialogs. * Fixed – Autocomplete not showing correctly under order dialogs. * Fixed – Buttons on eye exam in PE were not working correctly. * Fixed – Prevent bills that have no insurance assigned from being resubmitted, causing HCFA-1500 not to print. * Fixed – Inability for billing user to access Financial page from dashboard. * Fixed – Error with purging of extensions log. * Fixed – Preview of encounter gives off error if CPT codes are saved before billing is saved. * Fixed – Supplements inadvertenly creating empty bill even if Purchase button was not clicked. * Fixed – Draft messages not being saved properly. * Fixed – Fax capture is acquiring duplicate entries. * Fixed – Printing chart was including old versions of encounters when addendum is made. Here’s how to incorporate SNOMED in your NOSH installation! Because SNOMED-CT is licensed, it cannot be automatically bundled into the NOSH installation package. Check http://www.ihtsdo.org/licensing/ to determine if you live/practice in a country that is a member of IHTSDO. If so, you can download a free .zip file of the SNOMED data from your respective country. For the United States, click here to download the data. You’ll need to register to the UMLS website (if you’re not already registered) to be able to download the file. This may take up to 3 business days. This is a HUGE file. Jot down the last 8 digits of the zip file as this will be your date that you’ll enter in the install script for step 5. Unzip the file and place the contents of the directory RF2Release (in the zip file) to the /var/www/nosh/extensions/snomed directory of your Ubuntu server where NOSH is installed. Type in sudo bash /var/www/nosh/extensions/snomed/snomed_install.sh and follow the prompts. Log in to NOSH as admin. Go to Setup->Extensions->SNOMED-CT and enable the extension! Here’s how to get Vivacare patient instructions in NOSH! Go to http://vivacare.com and sign up for free. Once you have your practice ID and password, enter in under Setup->Extensions -> Vivacare Patient Education Materials when you login as Admin. Better yet, NOSH went on a major diet (going from 106 MB to 20 MB) for the installation package. And with more new features to boot! NOSH 1.7.0 is now ready for download through the Launchpad PPA or by installing the zip file manually. Enjoy NOSHing! Tags: c-cda, diet, snomed, vivacare | Permalink.